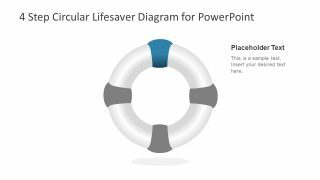 The 4 Step Circular Lifesaver Diagram for PowerPoint a simple slide deck of a lifebuoy. It has a donut-like shape, also known as life donut. 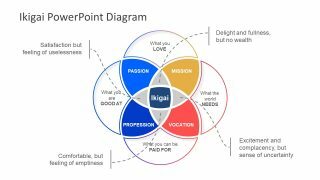 But in PowerPoint, the four curve parts of a shape represent the four segments of the diagram. It is a business presentation layout where users can provide solutions to complex problems. 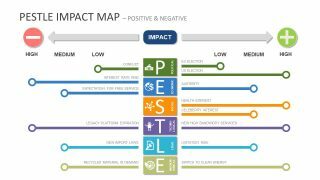 This presentation can enable an audience to brainstorm and rectify such a problem. 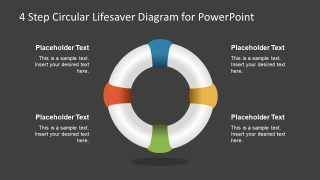 The template divides circular lifesaver into four color bands. This way, each color can easily represent a segment. Here, the first slide shows text placeholders with the title and description bars. 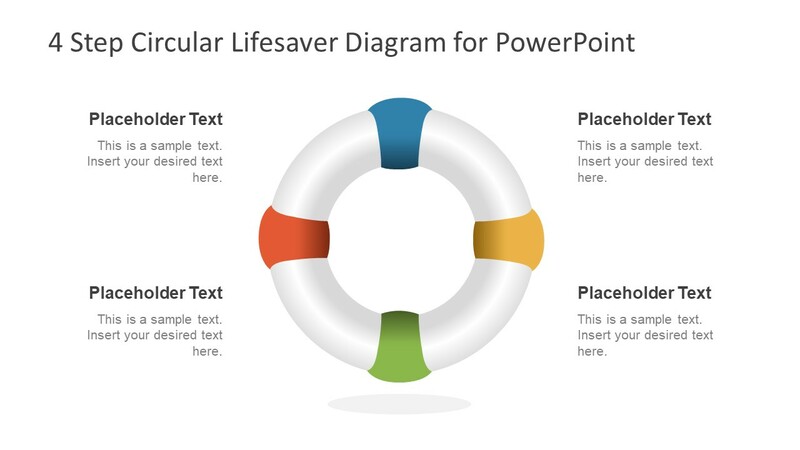 But users can change the color of slides according to the band on lifesaver diagram. 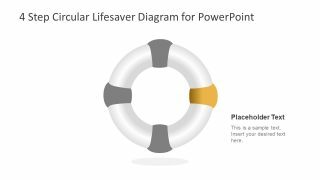 The 4 Step Circular Lifesaver Diagram for PowerPoint illustrate the concept of saving a person or object from drowning. Just like the buoy, which is designed to be thrown at a drowning person in the water. 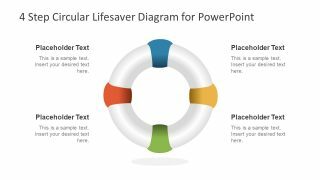 The 4-step circular diagram template for PowerPoint can display ways to prevent the unfortunate incidents. The bands on the circular lifesaver diagram visually illustrate the seawater activated lights to rescue during the night. 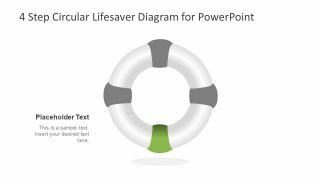 Therefore, the presenter can relate many protection, prevention and rescue missions in this PowerPoint. Similar to the real-life floating device which assists the wearer to float in water. The presentation here can also assist in explaining the immediate protocols to safeguard a company’s interest. 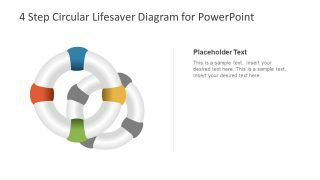 The diagram PowerPoint of 4 step circular lifesaver layout has 4 more slides after the first overview. 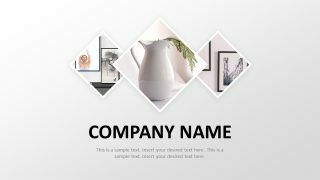 These slides help the viewers to focus on each segment in detail. 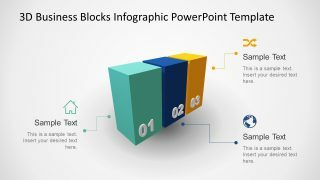 However, the PowerPoint also includes another background color version of 4 step diagram. The two-color background option enables the presenter to choose according to the presentation theme. 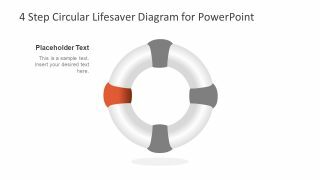 In business terms, the lifesaver is often used as a metaphor for professional help. For example, the business consultants, analyst, and legal advisers who save the company from drowning.